Jose Reyes kept his streak alive tonight in a winning effort over his former team. The Miami Marlins defeated the New York Mets by a score of 4-2. Reyes went 1-4 and received his hit in the fourth inning. Reyes now has a hit in 25 consecutive games. Reyes has the longest hitting streak in the Majors this year. The Marlins will play the Mets again on Wednesday Night when Chris Young Takes the hill for the Mets. Young is 3-5 this year with a 4.22 ERA. Reyes has yet to attract major attention for his streak thus far. If he makes it past 30 he will undoubtedly not be ignored any more. The UFC returned to Loas Angeles, CA and the Staples Center on Saturday night. The event was the UFC’s 4th special on the FOX network. The main show on FOX featured four fights. Two of the fights featured Light Heavywieghts that would determine who will face the winner of the Jon Jones VS Dan Henderson for the division’s championship. UFC President stated earlier this week that the fighter who looked “Most Impressive” would get the future Light Heavyweight Title shot. The show started with a Welterweight fight between Damarques Johnson and the returning Mike Swick. Johnson dominated the fight on the ground in the 1st round. When the 2nd round began the fight quickly turned around for Swick who was able to grab Johnson’s leg and take him down. While Swick was taking Johnson down when he delivered a knockout punch to Johnson and was victorious in his return to fighting after a 2 year absence. The next fight had Joe Lauzon defeat Jamie Varner in a Lightweight contest via submission in the 3rd round. This was an incredible back and forth fight that had both men matched up pretty evenly. Varner seemed to get tired as the fight progressed. Lauzon took advantage of Varner’s fatigue with a triangle choke in the 3rd round that forced Varner to submit. Great showing for both fighters but this fight made Lauzon look like a star. In the 1st of 2 Light Heavyweight bouts, Lyoto Machida defeated Ryan Bader in the 2nd round via knockout. Both fighters stood up during the 1st round and neither fighter took great risk or damage. Early in the second round Machida counter punched his way to a victory when Bader took a chance at charging at Machida with strikes. Machida looked good in this fight and ended it early like he was expected to do. The Main event and final Light Heavyweight bout took place between Shogun Rua and Brandon Vera. This fight was won by Rua with a knockout in the 4th round. This fight was mostly dominated by Rua who had Vera on the ground for a lot of the fight and landed more strikes. Vera did looked good in the fight with the amount of punishment he was able to take and still push through. Rua won when he knocked Vera down to the ground with a punch against the cage and was able to finish it by punishing Vera. Rua admitted he was getting tired towards the 2nd round and it showed. 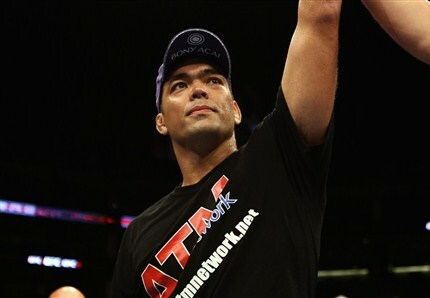 Lyoto Machida gets a future title shot. Dana White after the show was over announced that he felt Machida was “most impressive” and would recieve the future title shot. White’s decision was the obvious and correct one. Jon Jones is likely to be the Champion who will face Machida later this year or early next year. Jones does have to fight Dan Henderson who is a legend in the sport but probably will not be able to defeat Jones. Jones has previously defeated Machida so the fight will be difficult for the UFC to sell. That is the nature of the beast however and the UFC will just have to find a way to market the fight. This was a solid show with good fights that did not go to decision. The UFC needs to continue to put good shows on FOX so that they can attract more casual fans. It would be to their advantage to put bigger fights on the FOX shows to expand the audience. The UFC feels their main focus should be PPV and not the network specials. At least this turned out to be a good show but the UFC needs to step up their game on FOX if they want to create new fans. The basketball competition at the 2012 London Olympics began today. 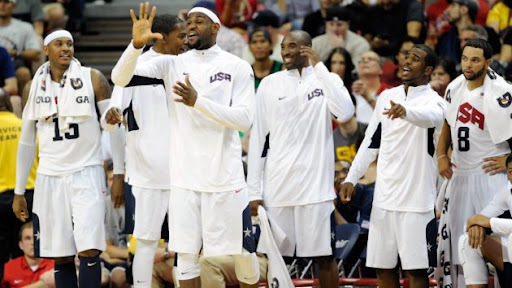 The US team came into this Olympics with high expectations. This years Team USA has been compared to the great 1992 “Dream Team”. Team USA took to the court against Tony Parker and the French team. The game tipped off at 2:30pm local time in London, England. The 1st quarter began with the US getting the first points on the board. Both teams were missing nearly all of their 3 point attempts. There were reports that the Olympic basketballs were sometimes slick and even over inflated, it would make sense given all of the missed 3 pointers. Neither team had very flashy play other than when Lebron James threw a long pass to Kevin Durant for a dunk on the French side of the court. The 1st quarter came to an end with France’s Yannick Bokolo hitting the games first 3 point shot. The score when the quarter ended was 22-21 in favor of team USA. Tony Parker led the French team in the 1st quarter with 6 points, while the USA’s leading scorer was Kevin Durant with 7 points. Lebron James started off the 2nd quarter with a 3 pointer. The US team played the French team well on defense in the early part of the quarter. Kevin Durant had an inedible blocked shot on a Nicolas Batum shot in the paint. The US team committed a lot of fouls in the 1st half of the game, the french team did well at the free throw line when the fouls were made. Durant continued his excellent play in the 2nd quarter with a beautiful 3 point shot with a little more than 4 minutes remaining in the half. Team USA moved the ball around very well and started racking up points. The half ended with the Team USA leading the French team by a score of 52-36. The leading scorer for the US in the 1st half was Kevin Durant with 14 points. The leading scorer for the French was Florent Pietrus with 8 points, he also was 4 for 4 at the free throw line. The US continued the excellent defending against the French in the 3rd quarter. Lebron received a great pass from Deron Williams for the layup at the rim with 5 minutes left to go in the quarter. The passing of the US team was perfect and counted for a lot of the scoring by the team. Kevin Love played really well in the game with his signature shooting and aggressiveness. The US ended the quarter leading 78-51. The US really played more fluid and started clicking better in this quarter. Tony Parker began the final quarter on the bench. Parker had been out of playing shape heading into the Olympics due to the eye injury he sustained a couple of months ago. The game was all but over, all that was left to do for Team USA was pull away even more in the score. The NBA’s #1 draft pick Anthony Davis got into the game in the final quarter and put his 1st ever Olympic points on the board. James Hardin made a nice break away dunk with 4 minutes left to go in the game. The bench was on the court for Team USA most of the 4th quarter, they are all top level players and showed it by holding the lead. The game ended like most thought it would with Team USA taking the game by a score of 98-71. Kevin Durant was the lead scorer in the game with 22 points, Ali Traore was France’s leading scorer with 12 points. Team USA looked really good today. They proved that they can play well together as a team and are likely to win the gold medals this year. Kevin Durant came out of this game as the teams best player and lead the team very well today. Many will say it’s Lebron’s team but after today I would say it’s Durant’s. Tunisia will be their next opponent on Tuesday night. That game like this one should not be a difficult one for a squad with this many great players. Will the Knicks Regret Letting “LINSANITY” Go? Jeremy Lin with the Houston Rockets. 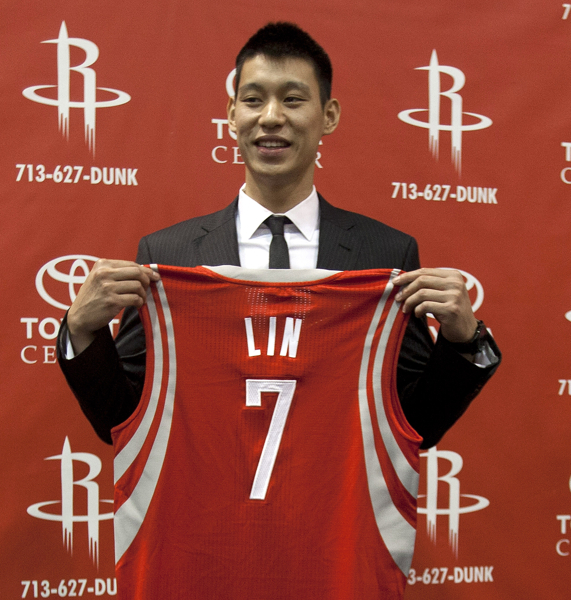 Last year’s breakout star Jeremy Lin was signed by the Houston Rockets earlier this week. Lin signed a 3 year, $25 Million deal. The Rockets had Lin in their training camp at the beginning of last season but let him go. The New York Knicks had a chance to match the offer given to Lin but declined. Houston took what many consider a gutsy move for the 23 year-old Point Guard. Jeremy Lin busted onto the Sports Scene last February when he stepped into the starting PG spot previously held by the then injured Carmelo Anthony. Lin made the most of his opportunity by becoming one of the teams leaders. He dominated games and flat out won many for them during his strong 3 week stretch. Lin was silenced quit a bit when the team started facing off against teams like the Miami Heat. Lin suffered a season ending injury in March and the “Linsanity” in New York was put on hold. The craze that Jeremy Lin ignited in New York was incredible. Over night the city became crazy over this young and recently unknown star. “Linsanity” was the name and it was popping up on signs and merchandise all over Madison Square Garden and New York. The possibilities for marketing this type of a player were endless. “Linsanity” has moved to the great state of Texas. Will he continue to flourish into the superstar many feel he will be. That is hard to say but if he does the Knicks made a bad decision. At this point the Knicks need a star with the charisma and appeal that Lin has. He has been replaced by a few players nearing the end of their career while he is just beginning his. If Jeremy Lin’s star continues to rise the Knicks will never forget letting him go. The New York fans will not let them forget what a grave mistake they made. The Knicks have been toiling in obscurity for far to long and Lin had shown during the month where he dominated the sports media that he could be the spark the team needed. The city of New York needed a star like Lin. The level of regret rides on how well Lin develops and evolves his game. As of this moment it looks like a bad decision for Knicks to let this player go. Only time will tell and we should know a lot in just 5 months. The NBA Draft is coming up this week and that means many story lines for many teams will take a twist through trades and picks. The biggest possible trade story leading up to the Draft is will the Magic trade Dwight Howard away for some great picks or even top level players. I have no faith that the Magic will take advantage of teams wanting Howard and wanting him now. Teams like the Houston Rockets are trading players and moving up in the 1st round with 3 picks in the top 20 as of Tuesday. Howard’s contract is up in 2013 and the Rockets want him prior to his contract expiring. The Magic might have a good opportunity to do something about their “Dwight Drama”. 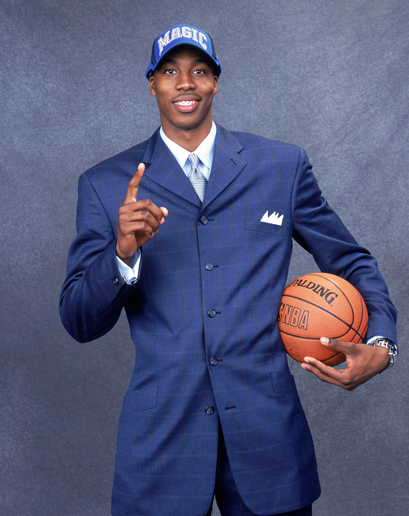 Dwight Howard on draft day 2004 after being selected with the 1st overall pick by the Magic. The Story of Dwight Howard and the Magic has been a complicated one. The Magic drafted Howard out of high school in 2004 with the 1st overall pick. Howard over the years has developed into one of the best big men in the game and has had some success with the team. Howard led the Magic to the 2009 NBA Finals where they were defeated by the Los Angeles Lakers in 5 games. The Magic have been contenders in the Eastern Conference for the last few years in large part to Howard. Dwight Howard has however also brought a lot of controversy to Orlando with his talent. He had a very public feud with the Magic’s former Head Coach Stan Van Gundy. It got really ugly during last season and Van Gundy was fired earlier this summer. Howard also brought drama near the trade deadline when he was not signing his clause to come back for his final year of his contract. He ended up signing hours before the deadline and the Magic did not trade him. It was a smart move for the Magic to put the pressure on Howard and to not trade him at the time when a trade for him would not yield enough in return for the Magic. I say the time to pull the trigger is on draft night. The Magic could possibly be offered some really good deals and should strongly consider every one they receive. The Magic need not look to far into their past to be reminded why they should get rid of Howard before his contract expires. In 1996 Shaq left the Magic for the Lakers in a similar situation where the team was not willing to give him exactly what he wanted and headed elsewhere. Shaq left and the Magic had nothing to show for it, they would have gotten a mega trade if they would have just looked around instead of fooling themselves that they could resign him. It has been an interesting season for the Miami Marlins so far. This team had a very new feel to it going into the season. A new name came first, no longer are they the Florida Marlins they are to be know now as the Miami Marlins. 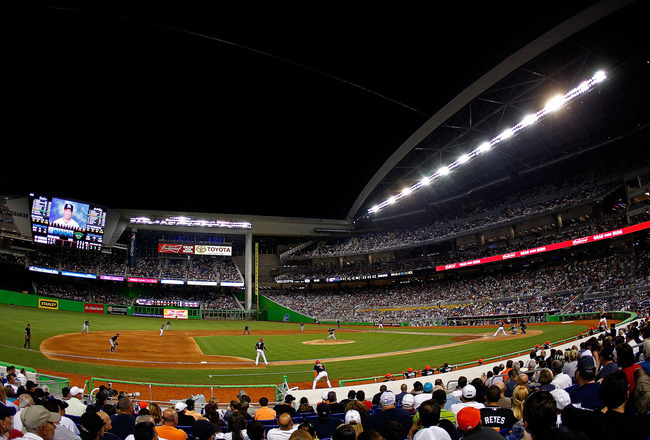 The new retractable roof stadium located in downtown Miami known as Marlins Park. The new manager Ozzie Guillen, who was acquired from the Chicago White Sox in the off season. Also new were big time free agents in Short Stop Jose Reyes, Starter Mark Buehrle and Closer Heath Bell. The team had not acquired free agents of this caliber since the 1997 season. But the newest thing for the Marlins was hope of contending in the N.L. East and winning their first ever division title. The Marlins finished April with just 8 wins and 14 loses. Many of those loses were to N.L. East foes the Phillies, Nationals and Mets. The Fish ended April at the bottom of the division. Not much seemed to go right for the Fish in April. Manager Ozzie Guillen was suspended by the team for a few games due to some ridiculous comments about Cuban dictator Fidel Castro. The team also was not preforming well on the field. Their production on the offensive side of the ball was horrendous. 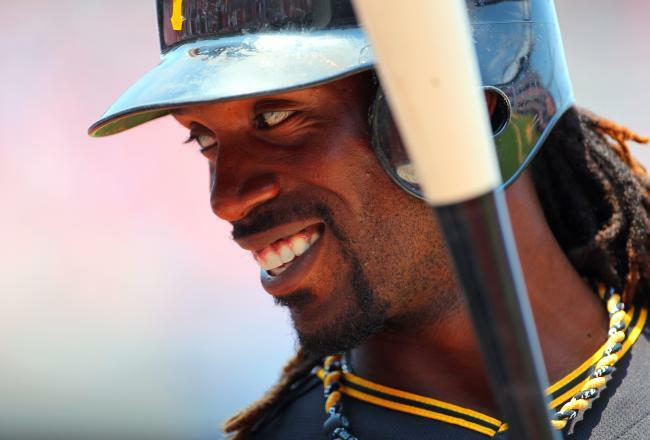 Stars such as Jose Reyes, Hanley Ramirez not playing very well consistently. Their young power hitter Giancarlo Stanton had no power to speak of. The guy that was supposed to be saving games for the team Heath Bell was blowing leads and games left and right. The team was in need of a restart when April ended. They got their fresh start in May and boy did they take advantage of it. The Marlins went on a road trip where they swept the Giants, Padres and took 2 out of 3 games against the Astros. The fielding got better, the pitching was awesome and the bats came alive in May. 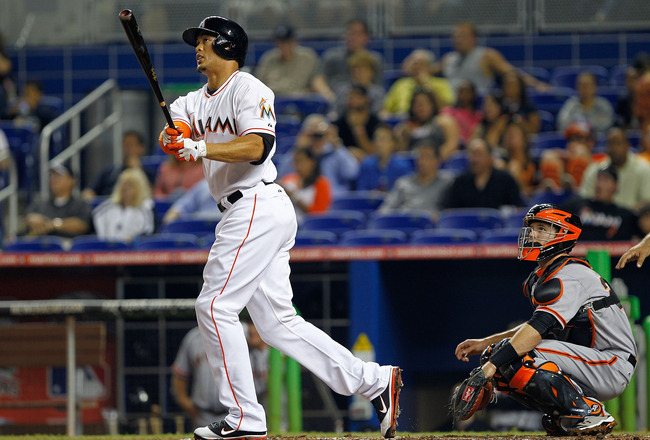 Giancarlo Stanton had an incredible month of May where he hit 12 home runs and had 30 RBI’s. Stanton even had a walk off grand slam in a home game against the Mets. Pitcher Ricky Nolasco got his 5th win of the season. Carlos Zambrano the loose cannon from the Chicago Cubs has pitched well and not lost his mind yet. The Marlins also played a lot better against division rivals. They took 2 out of 3 games against the Phillies, split a 2 game series with the Braves. The Marlins finished the final series of May by sweeping the 1st place Nationals in a 3 game series. The Fish had a record of 21 wins and just 8 losses for the month of May. The Marlins begin the month of June with a 29-22 record. It took the Marlins 2 month to make it to first place but they did it. They hold a tie with the Nationals for 1st place in the N.L. East. June is not going to be an easy month schedule wise. They will play 5 games total against the Phillies and 3 games against the Braves. The biggest challenge could be when they play a total of 6 games against their inter state rival Tampa Bay Rays. The Rays are also tied for 1st place in their division and have played really well as a team this year. So that series could be a tough one for the Fish. The Marlins are hoping to finish June the way they are coming into it, very hot. The rest of the season is going to be the real test of course. The Marlins were looking bad in April but impressed in May. The Fish play in the toughest division in baseball but have held their own so far. I believe the Fish have a very good chance of taking their first division title. This is a really good ball club that is finally playing as a team and are clicking on all cylinders. The prospects look very good for the rest of the summer but we will know for sure what this team is made of by September.